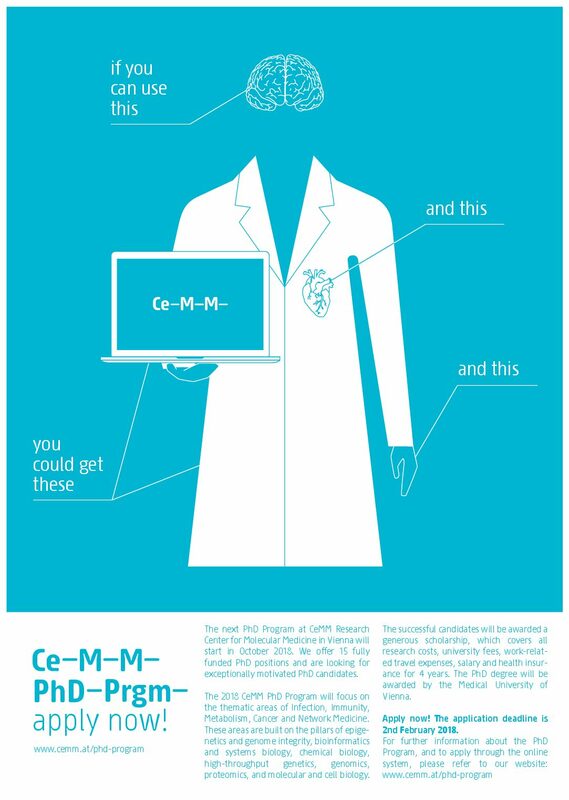 The CeMM International PhD Programme in Molecular Medicine is open for applications. If you are looking for a PhD project, you can apply until 2nd February! Especially medical doctors are encouraged to apply for a position at the CeMM International PhD Programme. CeMM International PhD Program in Molecular Medicine is open for applications! CeMM, the Research Center for Molecular Medicine in Vienna, Austria is the prime location to get your PhD. We want to encourage you and your student colleagues to apply to our PhD program – applications are possible until 2nd February 2018. We are an interdisciplinary and independent research institute in the middle of the campus of the Medical University of Vienna, working to prepare the personalized medicine of the future. Which topics do we work on? We use cutting edge technologies such as NGS, proteomics, preclinical disease models and combine it with a team of ambitious young group leaders to unravel the unknown in the areas of Infection, Immunity, Metabolism, Cancer and Network Medicine. We offer 4-year fully funded PhD positions, with close supervision, introductory lectures and lots of specials including a very international network of PhD students and social activities. Why should you apply as a MD? Because we want to educate the physician scientists of the future, because half of our faculty are MDs themselves, because we know that MDs bring invaluable expertise and drive – and – because we are always looking for these brilliant young MDs with interest in research.